Most people over-share their travel photos. When I see your blog post with twenty, thirty, fifty random pictures of some random place that you visited and thought was amazing, I try REALLY hard to stay interested! I really do! Some say that photos of people are more interesting. This might be true... but unless I know you really well, do you really think your random pictures of random places will be improved by adding faces of random people? I was recently lucky enough to spend a week visiting a close friend, terrorizing Montreal together and exuding general awesomeness. It was a fantastic trip and I'd like to share some of it... ideally, without boring any readers to tears. Thing 1. Of the eight hundred pictures I took, I am sharing only seven. 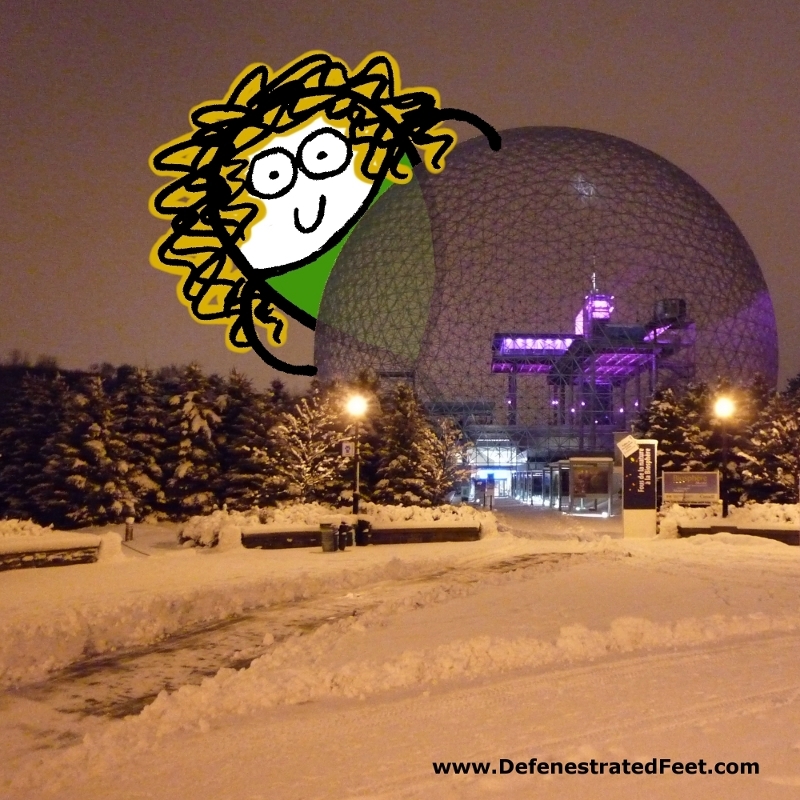 So without further ado, here are seven "photos" of my week-long reign of terror in Montreal. Godzilla ain't got nothin' on this! ...why aren't you running? Why are you looking at me with disdain and impunity? Do you expect me to speak French? Oh. Right... you do. Darn Quebecers! I have no idea what building I'm climbing, but this is my King Kong impression. It could use a few more screaming people... and some explosions. Everything becomes more epic with random explosions! We watched a Sound and Light show here, presented in French and narrated by the maniacal "ghost" of the Basilica. MWAHAHAHA!!! 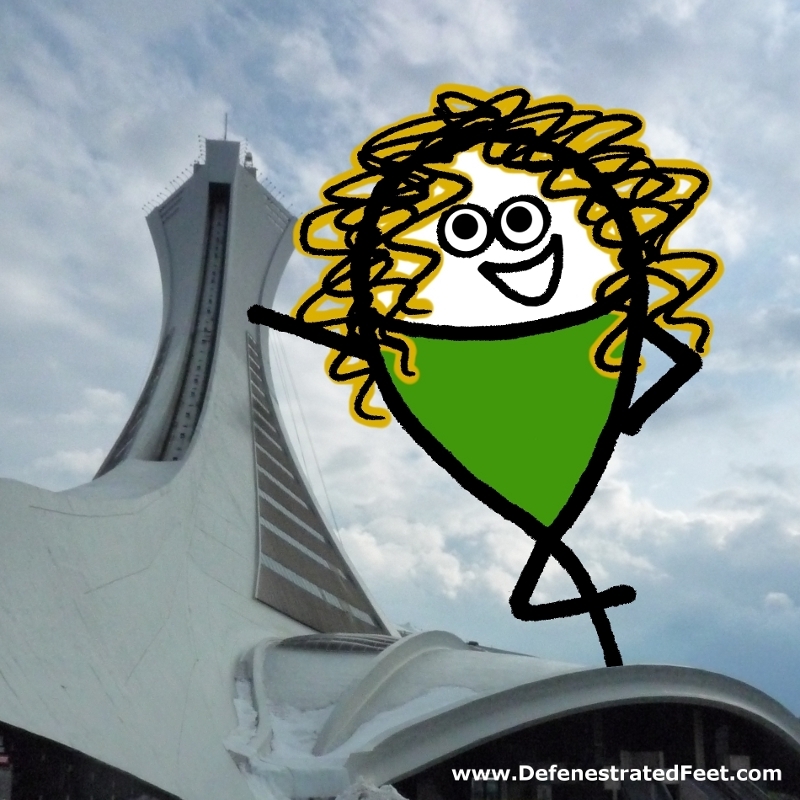 Olympic-sized me, posing with Montreal's Olympic Tower! We didn't go inside though. There were more important things to do... like looking at penguins. My favourite building in all of Montreal! This dome-thing (currently a water ecosystems museum) was designed by architect R. Buckminster Fuller. Scientists would later name carbon nanospheres (fullerenes) after him because they looked like his designs. TRIVIA: The metal dome structure was originally covered in acrylic panels, but in 1976 a massive fire destroyed the entire acrylic covering in 30 minutes! Epic old-time video footage here. Last but not least, I can't talk about Montreal without mentioning the culinary scene! 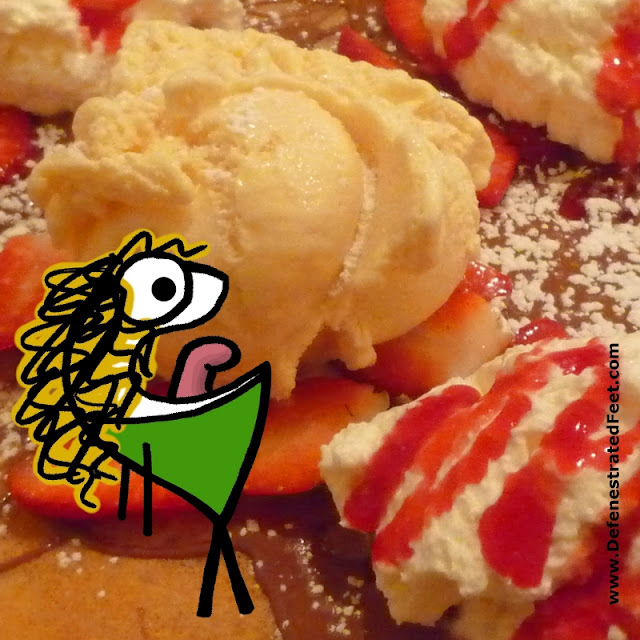 We visited a great little restaurant called Juliette & Chocolat, where I ate an ENORMOUS crêpe. Ice cream, whipped cream, strawberries, raspberry syrup... and chocolate. Speaking of chocolate, their drinks menu alone had over twenty different types of hot chocolate. The fancier fare were described like fine wines... each claiming a subtle flavour infused into the cocoa from the dirt itself. The typical fare was there too. Mint hot chocolate? Got it. Peanut butter hot chocolate? Definitely. Fairy tears and angel dust hot chocolate? If such a thing exists, they're hoarding it in a back room somewhere. 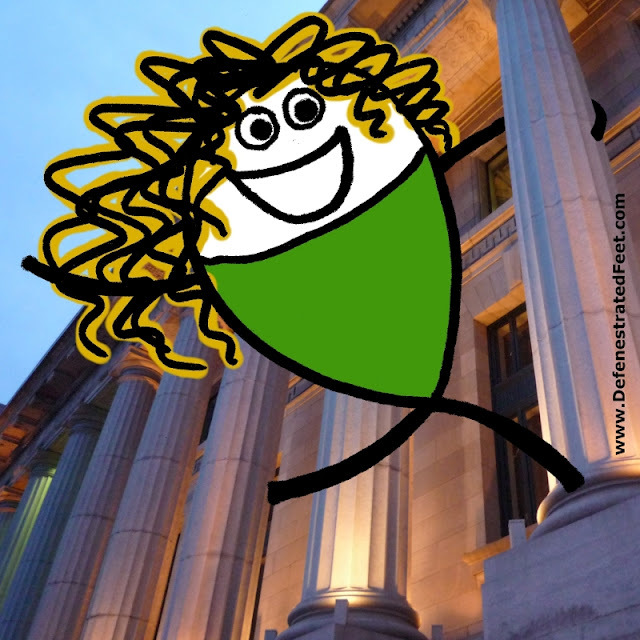 A question for all my fellow doodle-bloggers and blogger-illustrators: have you ever drawn yourself into a photo? Oooh! I want to try this! I've never drawn myself into a photo before, and you're right! It does add 300% more awesomeness! It's both informative and hilarious! Thanks for stopping by my blog so I could come and meet you. I always get so happy when I find something different. Your place and drawings are very special. I love your blog so much! It's so you and so real! I can relate with ur posts esp procastination is history. Keep it up girl! Definitely my favorite post so far ;). Loved it!! Ahahaha of course it would be! ;) It's all thanks to you after all! These are the most interesting travel photos I have seen of someone I have never met. Hell, they're interesting than looking at ones from half the people i know. I've never drawn myself in a photo. I should try that one day! Also...I LOVE BUCKYBALLS. That is all. *Fist bump* YES! I KNEW someone else would understand! And the perfect number. I hate it when someone has dozens and dozens and frickin' dozen of photos. It's worse when they're physically present and insist on setting the pace at which they show each photo, telling a story about each and every one, and all the while all you can think of is the sweet oblivion of death so you don't have to see any more. Guess I should apply my principles of blogging to offline life too! And I definitely would like to try to draw myself in a photo. But I'm not sure how.. what do you use? Paint? So...I'm in love with your character. It's flippin' rad. I've never publicly shared it, but I once drew myself using a photo on illustrator. I dimmed the photo of me so like 30% and drew over it in another layer. It turned out pretty cool but also awful. so glad you don't have a stupid captcha that I can never replicate. Thanks! I looove your drawings too, they are frickin' adorable! Glad someone appreciates my lack of captcha. =] I just turned that thing off the other week, and no spammy spam spammers yet! It'll stay like this unless spam ever becomes a MAJOR problem. I just discovered your blog because you just discovered my blog and now we have this mutual relationship of bloggy awesomeness and following each other, but not in a stalker-ish way, in a way that says wow you are super-funny and where have you been hiding and why have I not found you sooner? Anyway, first I want to say (okay, I guess it is "Second I want to say" since I had that rambling star-struck thing going up there in the first paragraph) that if you decide to make t-shirts with the first image of you like Godzilla in the city, I would totally buy it. I want that as my screen-saver, I want it on a mouse pad, I want it on note cards, that is the frickin' best picture ever. Next, I wanted to tell you I totally agree with your stance on people's boring travel photos. It drives me crazy when my sister wants to share "just a few" photos from her weekend in Napa, and then guess what, my computer crashes from trying to load the 80 thousand photos that are on her Picasa photo album thing (that it refuses to show me unless I join and sign up, grrrr. but I digress). One time, my sister Oakley was visiting us and she brought actual 4 x 6 photos in her hand to show us. The pics were of her and her husband sky-diving. I would maybe need to see, like 5 shots of that. No. She has (literally) 200 shots. I was like, hey! *HOW* many times did you jump out of that plane??????? Seriously, Ellen, how does anyone have 200 shots of jumping out of an airplane? Isn't it only about one minute or less between airplane to ground? So as you can imagine, all the shots were identical ("Here is me screaming and the wind is blowing my hair just about out of my helmet"). I wish Oakley would read your blog and realize the cap on the appropriate number of photos is 7. So, I will be back later to read your archives. good stuff. keep writing. 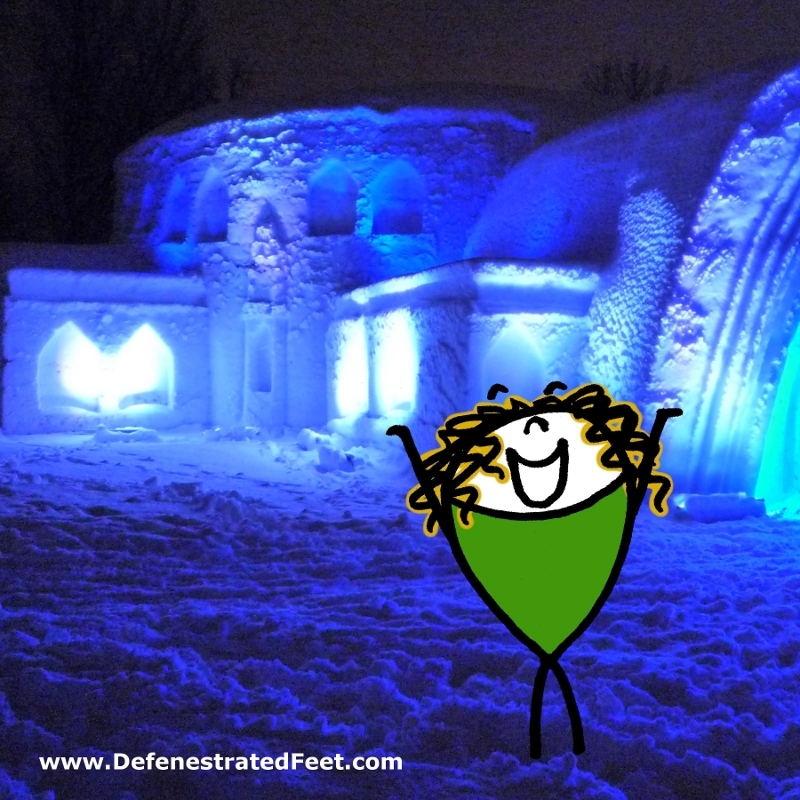 ps--had to go look up what "defenestrated" means. bwahahahahah ha ha ha ha ha! love it! When I was a very young person, maybe twelve, my father took me to hear Fuller speak at the college one evening. My brush with fame, I am pretty sure we got to say hi and shake his hand. I think I will call my childhood friend and ask her if she remembers this event. Way better. "Look kids...Parliament. Big Ben." How many architecture shots can a person stand? Awesome blog. Ahahaha, so true! I think most photos lose 40% of their awesomeness value every time someone takes them. Thanks Marianne! Visiting from MOV. 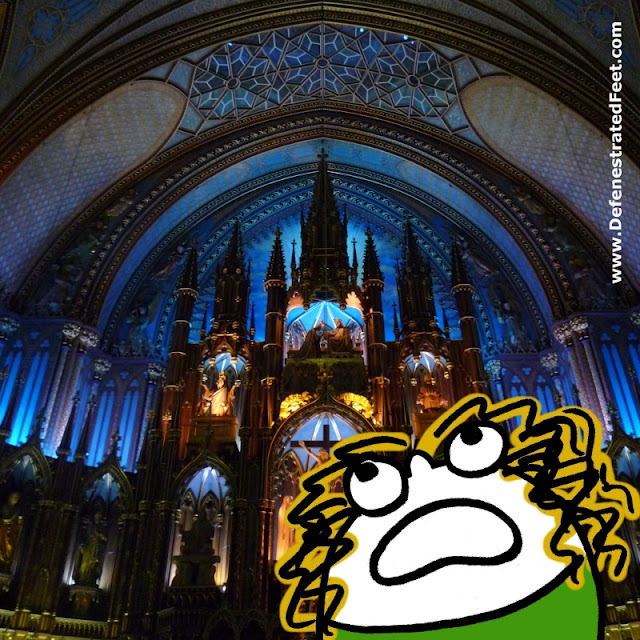 As a Quebecoise, I thoroughly appreciated your descriptions of Montreal. Loved the drawing yourself into pics as well! Great post! I loved loved loved it! Hhaha very cool! I have not done that yet, but it's always a possibility..
You should! 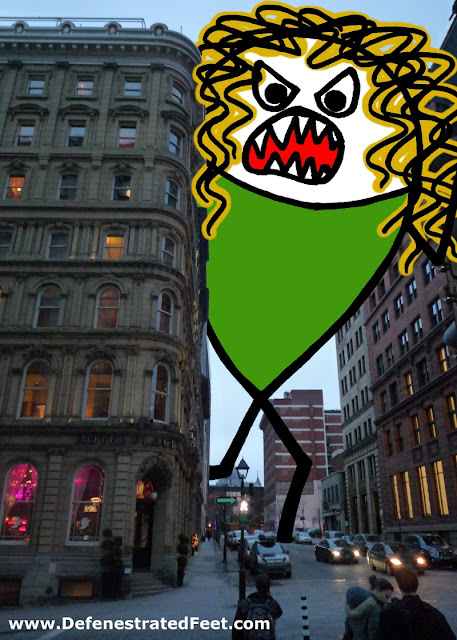 Or better yet, get Allie to photo-terrorize a city for double-scare effects! Thanks! I enjoyed answering your questions; they were really creative. Headed overe from MOV's place! You are so photogenic! Best vacay photos ever! Well, I think it's fair to say that we draw ourselves into just about every picture. But I love this concept for a vacation. And more than that, I love that you're huge next to buildings, but shrunken down to eat pie. Brilliant. Because who wants to eat 30 pies on their vacation, just to get full? At that shrunken size, 1 pie could kill you. Ugh, I COMPLETELY agree. I made a pie today to celebrate pi day (which was this Wednesday) and just one piece had me stuffed full to bursting! He he - sooooo much better - it's like...like...like you're really there.